After spending 3 months in Sri Lanka (see Travel episodes 1974: Among the Veddas, and 1975: An illegal walk through Wilpattu), and about ten weeks in Thailand, Malaysia, Sumatra, and Borneo (see Travel episodes: Borneo 1975 – Canoe trip with Punan tribals), it is now time to go home. I decide to undertake the long journey over land, wherever possible, as this will be an excellent opportunity to experience – and compare – the various cultures and religions on my way. From Kuala Lumpur, I get a lift with various cars and trucks, heading north through Malaysia, to the town of Kota Bharu, where I board a bus to the Thai border, and then another bus to Bangkok. As I have visited this city earlier on my trip, I immediately book a flight ticket to Calcutta, the largest city in West Bengal, eastern India. It is not possible to cross Myanmar over land, so I am forced to fly. I am now accompanied by a young German, Eberhard, and a bus brings us from the airport to downtown Calcutta. After experiencing the relatively civilized Southeast Asia, this metropolis is an overwhelming experience, displaying an entirely alien culture and religion. Everything seems utterly chaotic in this city, where trucks, busses, cars, motor-rickshaws, ox-carts, motorcycles, scooters, pedestrians, and sacred cows mingle in a seemingly hopeless tangle, but, almost miraculously, traffic is still moving, albeit at a snail’s pace. In Calcutta, you also notice the old-fashioned rickshaws – two-wheeled, open carriages, pulled by a man, who is running – most often barefoot – in front of the vehicle, holding on to two bars. Eberhard and I board a crowded train, headed for our next stop on our journey across India, Varanasi – the most sacred of the seven sacred cities of the Hindus, situated at the most sacred of all rivers, Mother Ganges. Hindus consider bathing in the river at this spot especially cleansing, and every day thousands bathe in it, convinced that it will remove their sins. The original name of the city was Kashi, meaning ’light’, and as the city is situated at the river bank, facing east towards the rising sun, you may call it ’a city of light’. Its more recent name Varanasi is a combination of the names of two rivers, Varuna and Assi, which have their outlet in the Ganges at this spot. During the British colonial period, the name Varanasi was corrupted to Benares. Archaeological evidence suggests that Varanasi was founded about 3,000 years ago. However, most of the present buildings are not particularly old, as the city has been destroyed several times during invasions by e.g. the Moghuls, a Muslim tribe from Turkmenistan, who conquered most of northern India. For about 300 years, they ruled this area. Especially during the reign of Emperor Aurangzeb (1658-1707), who was a fanatic Muslim, many Hindu buildings were destroyed, in Varanasi e.g. the Golden Temple, which was replaced by a mosque. We roam the lanes of Old Varanasi, which are so narrow that cars cannot enter. What you encounter here are pedestrians, water buffaloes, sacred cows, and an occasional motorcycle or scooter. Loud shouting announces that a burial procession is on its way towards the Ganges. Many old or sick persons are brought here to die, later to be cremated on the banks of the sacred river. Following the cremation, their ashes are strewn on the river, increasing their chance of attaining moksha – liberation from the eternal sequence of re-incarnations. (Read more about moksha and other Hindu phenomena on this website, see Religion: Hinduism). It is the hottest time of the year in North India, the sun baking from a misty, yellowish sky throughout the day. We are always thirsty, despite constantly drinking tea and water, and eating plenty of oranges. Eberhard plans to go to Bombay, while I want to leave this baking oven as quickly as possible. The train journey to the capital of India, Delhi, is a lengthy affair, so in order to avoid a trip similar to the one we experienced from Calcutta to Varanasi, where we had to sleep on the floor, I book a so-called ‘sleeper’. A Second-Class sleeper is just a plank bed with a thin cover, which you have the right to occupy during the night. I spread out my worn-out sleeping bag to announce that this place is occupied. In the morning, I awake early, and during a stop at the next station, I leave the train to buy breakfast on the platform: puri, which is pancake-shaped loaves, fried in oil, until they pop up, served with tamarind sauce, and samosas – small, deep-fried triangles of dough, containing potato curry. Refreshed, I can now concentrate on watching life on the immense, flat, dusty Ganges Plain. In the villages, houses are mostly made of clay and straw, often surrounded by groups of mango or fig trees, which cast long morning shadows. Beneath these trees, in the shade, village men will gather in the evening after a long day’s work to talk and smoke a bidi (a ‘poor man’s cigarette’, made from the leaves of a tree, Diospyros melanoxylon). Carts, pulled by oxen, move at a snail’s pace along bumpy tracks, and the leaves in small bamboo groves rustle in the morning breeze. A flock of vultures are fighting with dogs over the remains of a dead cow. Many people are defecating on the railroad slopes, oblivious of the passengers watching. Occasionally, we pass stinking industrial towns, where factory chimneys emit huge quantities of black smoke into the already misty landscape. Lots of vultures and kites are soaring over the fields, while gorgeous Indian rollers (Coracias benghalensis) take off from the thickets. Various birds are feeding in puddles along the railroad, such as black-winged stilts (Himantopus himantopus), pond herons (Ardeola grayii), and yellow-billed egrets (Mesophoyx intermedia). Late in the day, the train arrives at New Delhi Railway Station, which, despite its name, is situated closer to the centre of Old Delhi than to New Delhi. Not far from the railway station, I find a suitable lodge, then leave to explore Old Delhi. Many of its lanes resemble those in Varanasi a bit, but are wider and somewhat more ’modern’. Throughout its long history, Delhi has been a capital at least eight times, e.g. during the Muslim reigns of the Delhi Sultanate and the Moghuls, and later during the British colonial days, when the capital was moved here from Calcutta. Today, Delhi is the capital of the Indian Union. Not far from the fort is Jama Mashid (’Friday Mosque’), India’s largest mosque. Like the fort, its construction was initiated during the reign of Shah Jahan, completed in 1658. Friday prayer takes place on the 99-metre-wide main square, which is able to hold 25,000 people. Centrally on this square is a small pond, in which you wash your face, hands, and feet before the prayer. The mosque contains two minarets, both 39 metres high. According to legend, a small building in the north-eastern corner of the mosque displays a footprint of the Prophet Muhammed himself. From the city of Peshawar, northern Pakistan, I board a bus, headed for Kabul, capital of Afghanistan. At the border, many men are armed with rifles, and a hole in the windscreen of our bus, made by a rifle shot, testify to the unstable conditions in this region. From the relatively lush Pakistan, we now enter a far more barren, desert-like area, and birdlife changes from tropical species like black drongo (Dicrurus macrocercus) and common myna (Acridotheres tristis) to Palaearctic species like raven (Corvus corax) and European bee-eater (Merops apiaster). Large parts along the road are covered in bright red poppies (Papaver). Our journey brings us across the famous Khyber Pass, situated in the Spin Ghar Mountains. Formerly, almost all conquerors passed this way to enter the Indian Subcontinent, among these Persian kings Darius the Great (550-486 B.C.) and Mahmud of Ghazni, born Yamin-ud-Dawla Abul-Qasim Mahmud ibn Sebüktegin (971-1030), Afghan Muhammad Ghori, born Shihab ad-Din (1149-1206), Mongolians like Genghis Khan (c. 1162-1227) and Duwa (dead 1307), and Babur (’Tiger’), born Zahir ud-Din Muhammad (1483-1530), a Timurid prince of Turkic origin, who later became the first Moghul Emperor of India. Motorized vehicles in this city mostly consist of busses and trucks, while private cars are remarkably few. Donkeys constitute a considerable part of the street scene, and several men are busy loading the animals with various items, e.g. apples or garlic. In many places, tiny cages, containing various species of songbirds, such as calandra larks (Melanocorypha calandra), crested larks (Galerida cristata), goldfinches (Carduelis carduelis), and red-fronted serins (Serinus pusillus), are displayed for sale. Songbirds are popular pets in many Muslim societies. The bus leaves for Kandahar early in the morning, and the first couple of hours of our journey through the mountains is a cold affair. My fellow passengers huddle behind the seats, enveloped in all their clothes. From the mountains, we enter a flat, desert-like plain with scant vegetation. Tiny villages are surrounded by growths of slender poplars, and farmers are ploughing the few fields with oxen. Birdlife in this region displays species like crested lark, hoopoe (Upupa epops), isabelline wheatear (Oenanthe isabellina), and pied bush-chat (Saxicola caprata). I also notice several fat bobak marmots (Marmota bobak), a ground squirrel the size of a hare. Despite having only about a hundred thousand inhabitants, the desert city of Kandahar is spread over a huge area, as no house has more than two storeys. The bazaar is a lively and colourful spectacle, and among many other items, vegetables are sold here. To make them look more inviting, they are rinsed in water, running in the gutter. However, this water is extremely dirty, and I immediately lose any craving for raw salads! Meat products and sweets are displayed for sale, attracting thousands of flies, which swarm around the goods. I notice several blind beggars, who are probably suffering from trachoma, an eye disease transmitted by flies. From Herat, I board a bus to Mashhad in eastern Iran – sacred city for Shi’a Muslims. The origin of the two major denominations within Islam, Sunni and Shi’a, almost date back to the foundation of Islam. Following the death of the Prophet Muhammed, in 632 A.D., certain Muslims, who later called themselves Shi’a (from Shi’atu Ali, ‘followers of Ali’), only acknowledged direct descendants of the Prophet as his heirs, maintaining that God – via Muhammed – had selected his cousin, Ali ibn Abi Talib (601-661) – who was also his son-in-law – as the leader of Islam, called Imam. Ali’s sons, Hassan and Husain, were Imam number two and three, succeeded by their descendants. In 681, Husain and his followers went to Iraq to fight against the Caliph of Damascus, who claimed that he was the true heir of Muhammad, selected by a council of elders. The Shi’a did not acknowledge this choice, maintaining that only God could appoint Muhammed’s heirs. In a battle at Karbala, Husain and his men were all killed, and from this day, the Caliphs of Damascus, and later Baghdad, held the power within Islam. Instead of the caliphs, the Shi’a acknowledge a succession of 12 Imams, all descendants of the Prophet. They maintain that the 12th Imam, Muhammad ibn Hasan al-Mahdi (868-941), disappeared, but will return in due time as the ultimate saviour of mankind and, together with Isa (Jesus Christ), bring peace and justice to the World. In 818, the 8th Imam, Ali ibn Musa al-Riḍha (in Iran known as Imam Reza), was murdered by order of the Abbasid Caliph, al-Ma’mun. The place he was buried was called Mashhad al-Ridha (‘Martyrdom of al-Riḍha’), and in the late 9th Century, a dome was erected on the grave. Later, numerous other buildings were built on this place, today constituting the largest Islamic temple complex. When I visit this mausoleum, the entire area in front of it is one huge construction mess. At the entrance, I learn that non-Muslims do not have access to the complex, but I am welcome to walk around it. On my walk along the outer wall, I can admire the wonderful tiles on it, adorned with Muslim inscriptions in beautiful calligraphy. My journey now continues by bus towards Tehran, the capital of Iran. On our way, we pass through the most wonderful forest in the Elburz Mountains, south of the Caspian Sea. (You may find a thorough description of this area elsewhere on this website, see Travel episodes: Iran 1973 – Car breakdown at the Caspian Sea). We arrive in Tehran at 1 A.M., and all hotels are either full or closed. However, I am told that I can sleep in the telegraph office. The following morning, I board another bus, headed for Tabriz and the Turkish border. The area around Tabriz is a lovely green, with poplars, in which rooks (Corvus frugilegus) are building nests, and wheat fields, where white storks (Ciconia ciconia) strut about. Yet another bus brings me along the huge Lake Van in south-eastern Turkey, a region known as Kurdistan. This area is inhabited by Kurds, a people with a sorry fate (see Travel episodes: Iran & Turkey 1973 – Kurdistan! Bum-bum-zip!). Birdlife is rich along the road, with species like lesser kestrel (Falco naumanni), ruddy shelduck (Tadorna ferruginea), European roller (Coracias garrulus), and woodchat shrike (Lanius senator). Small Anatolian ground squirrels (Spermophilus xanthoprymnus) sprint about along the road, and in case of any danger, they quickly vanish into their dens. My goal is the town of Birecik, on the banks of the Euphrates River, near the Syrian border. This town is home to a small breeding colony of the globally threatened northern bald ibis (Geronticus eremita). This species was once widespread across the Middle East, northern Africa, southern Europe, and the Alps. However, it disappeared from Europe more than 300 years ago, and the other populations also plummeted. By the mid-1900s, only two colonies were known, in southern Morocco and here in Birecik. The first description and illustration of a northern bald ibis appeared in Historiæ animalium, Liber III, published in 1555 by Swiss physician and naturalist Conrad Gessner (1516-1565). He named it Corvus sylvatico (‘forest crow’), which in Old German became waldrapp – a name which has stuck to this day. The generic name Geronticus is from the Greek gerón (‘old man’), referring to the bald head of the ibis, while the specific name eremita is from the Greek eremía (‘desert’), alluding to the barren habitat of the species. Illustration from the internet: Public domain. From Birecik, I head west, often getting free lifts on trucks, or paying a nominal fee. On the whole, Turks are a very friendly people, and although I only speak a few words of Turkish, I get along fine with the drivers and their helpers. Some of them speak a bit of German, as they have been working in Germany to send back money to their families. On one occasion, I am sitting on the body of a truck, when I notice another truck, lying upside down in the ditch along the road. My truck comes to a stop, and the driver gets out to investigate. He returns, saying, “Zwei tod!” (‘Two dead!’). This doesn’t really surprise me, as Turkish truck drivers often drive like lunatics, taking insane chances when overtaking. My next goal is the small town of Çeşme, on the Mediterranean coast of Turkey, near the city of Izmir. During my stay in Sri Lanka, I met two Danes, Pia Rasmussen and Fritz Hansen, whom I stayed with for some time. They were planning to spend the spring on the Greek Island of Chios, and we agreed to meet there in May. Greece is not a good place to hitch-hike, as I often have to wait for several hours at the roadside to get a lift. Consequently, I board a bus to Thessaloniki, from where I go by night train to Beograd, the capital of Yugoslavia. This turns out to be a better place to hitch-hike, as four lifts bring me to the small town of Ivanic Grad, near Zagreb. While I trudge along the road towards the centre of Ivanic Grad, a car comes to a stop, and the driver informs me that I can sleep in his new house, which has not yet been fully completed. As it turns out, he has already had a fair share of drinks, but nevertheless makes a stop at a restaurant, where we meet some of his friends who offer more drinks. After some time, I am not quite sober myself. On our way towards the man’s house, his reaction speed has now been reduced to a degree that he forgets to turn at a road bend, causing the car to slide sideways into the ditch. This doesn’t bother him much. He gets hold of some friends who can pull his car out of the ditch, and we continue our journey to his house, where he bids me good night. The following morning, I get a lift to Zagreb, but, unfortunately, I am dropped at a place with a long queue of cars. I trudge along the road, but then I am lucky again. A car comes to a stop, and the driver asks me if I want a lift to Germany! He is a young Turk, who is in a hurry to go back to Germany, where he is working. His father, who didn’t go back to Turkey on holiday, has fallen sick. The young man already has two other passengers, one of whom I met previously in Pakistan. By contributing a small amount for petrol, I get a lift the rest of the way through Yugoslavia and most of Austria. On my way, I notice flowers like Christmas rose (Helleborus niger), alpine snowbell (Soldanella alpina), spring gentian (Gentiana verna), and alpine butterwort (Pinguicula alpina). 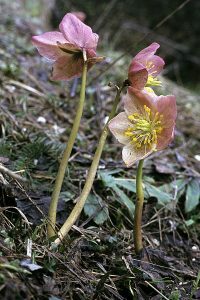 The Christmas rose, also called black hellebore, is among the earliest flowering plants of the Alps, sometimes appearing in winter, as the name Christmas rose implies. Incidentally, the species has nothing to do with roses, as it belongs to the buttercup family (Ranunculaceae). The generic name of snowbells, Soldanella, is a diminutive of the Italian word soldo (‘coin’), thus ‘little coins’, referring to the leaf shape of most of the 15 species of this genus. – Pictures of another species, the dwarf snowbell (S. pusilla), are shown elsewhere on this website, see Nature: Snow and ice. Birdlife in this area is scarce at this time of the year, but I do observe ring ouzel (Turdus torquatus), water pipit (Anthus spinoletta), and alpine accentor (Prunella collaris). When I reach the pasture huts on Rinnberg Alm, snow is still covering the ground in most places. The door of a wood shed is unlocked, so I decide to spend the night in it. There is a very fine view from a ridge, and I look forward to enjoy the morning sun in this lovely place. But alas, when I wake up the following morning, the mountains are hidden in clouds, with a cold wind blowing. I quickly pack up, returning the way I came. Three days later, I have reached the vicinity of the city Marburg an der Lahn, central Germany. I have just been dropped at a hopeless spot, where the motorway divides, as the driver, who picked me up, was going the opposite way. Not only does it seem hopeless to get a lift on a motorway, where cars are not allowed to stop, but staying here as a pedestrian is also highly illegal. Disheartened, I trudge along the highway, when the incredible thing happens: a minivan comes to a halt, and the driver, who has a huge, curly hair, asks me if I want a lift. If I do! His name is Dieter, and he and his wife make a living from picking up all sorts of things, e.g. from estates of deceased persons, which nobody else wants, selling the most useful items at flea markets in Frankfurt. They live in a small farm house in the village of Wittelsberg, and Dieter kindly invites me to stay with them for a couple of days. Here I meet his wife, Judith, who is likewise very friendly. Their home is an unbelievable collection of things, which most people would call old rubbish, but a cozy and happy atmosphere prevails here, so I spend a few lovely days with the family, before taking to the road again. On May 14, I am back in Denmark, 39 days after leaving Kuala Lumpur.